Apply a bead of adhesive to underside of base. Firmly press SPIKES onto surface so that it makes solid contact. Allow adhesive to dry; it will form a 'rivet' through the holes in the base. 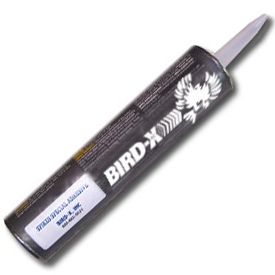 Bond only to dry, clean surfaces, when the temperature is between 0°C and 49°C. If two installers are working, one can carry a quantity of stacked spikes in one hand, and apply adhesive with the other hand, while another affixes each unit to the surface. If one installer is working, he/she can lay each unit upside down (base side facing up) on the surface, in the place it is to occupy. Working along the line, the installer can apply adhesive to each base, then turn the unit over and affix it to the surface. Please note that we cannot ship SPIKES Special Adhesive by air. If your order contains the SPIKES Special Adhesive and you choose a shipping method via air, we will not send it by air. We'll ship the rest of your order by air and contact you for further instructions about the adhesive. Dimensions: 12" x 2" x 2"